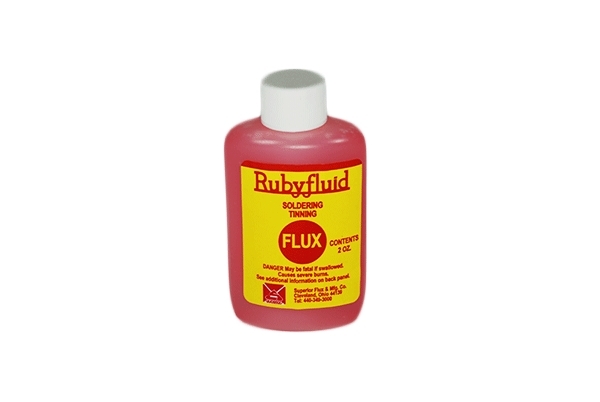 Superior RubyFluid is a water-soluble flux formulated for soldering. The flux is a non-fuming, self-cleaning soldering flux. The flux exerts a strong scavenging action to remove oxide coatings and other impurities from the metal surface to produce strong joints. Pre-cleaning is not necessary under most conditions. Rubyfluid has been giving superior results for plumbers and workers in brass, copper, tin, steel and stained glass since 1907. A soldering flux that is easy to use and produces strong, neat, and durable joints. Rubyfluid adheres quickly and stays where you put it. Reduces amount of solder used by causing solder to flow in a thin film.